Indian car scenario has matured very well in recent times, we have seen many examples of rare cars in India. Here are two more which have landed in India recently through carnet. 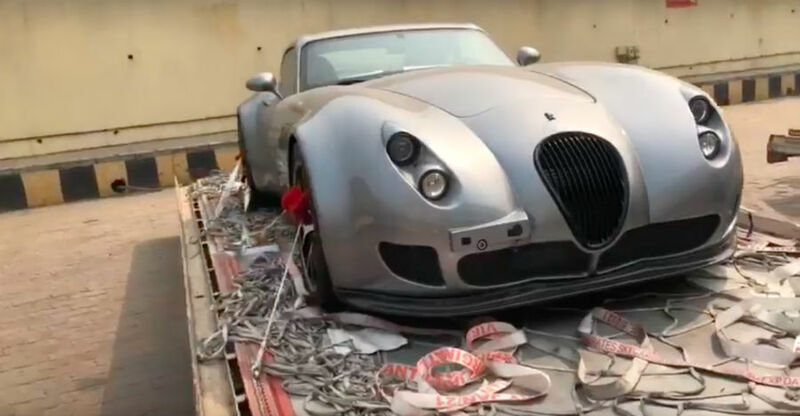 Seen here are the Wiesmann GT MF 5 Coupe and MF 4Roadster versions of the vehicles that have been spotted getting unloaded from a container at an airport. These vehicles will not stay in the country for long as would go back to their home country after their legal stay permit comes to an end. Both the vehicles can be seen in the video but the person recording the video majorly shows only the Coupe version of the vehicle. The roadster version can be seen on the truck that is parked in the background. Wiesmann is a lesser known brand that produces hand-built customised vehicles. The vehicles seen in the video are quite rare. The manufacturer launched the GT MF4 in 2003 and in 2009, the GT MF5 was launched with more powerful and a limited production of only 55 cars. Post the launch of the MF5, Weissman has not launched anything in the market. Interestingly, Wiesmann brand is owned by an Indian family and both the cars were spotted at a big fat Indian wedding. Both the MF4 Roadster and the MF5 Coupe are powered by the BMW’s engines. The MF4 Roadster gets the 4.4-litre turbocharged V8 engine that generates a maximum power of 402 Bhp at 5,500-6,400 rpm and a peak torque of 600 Nm. It gets a 6-speed automatic transmission that powers the rear wheels of the vehicle. The Wiesmann MF5 coupe gets the more powerful BMW V10 twin-turbocharged engine that generates a maximum of 547 Bhp and 680 Nm. It gets a 6-speed automatic transmission with flappy paddles. The Coupe can reach a top speed of 311 km/h while the MF4 can only reach around 291 km/h. Both of the vehicles are hand built. The MF4 roadster gets an all aluminium chassis with fibreglass reinforced body. The GT MF5 gets an aluminium monocoque chassis with the same fibreglass body. Both the vehicles look quite unique and get a vintage car inspired design. The vehicles do not offer any high-tech features and are built for an exhilarating experience. Both the vehicle are quite lightweight, especially for the power the posses. The Wiesmann MF5 Coupe weighs 1,405 kg while the MF4 roadster weighs 1,390 kg giving them a mighty power-to-weight ratio. Unfortunately, we would not be able to see much of both the vehicles as they will head back to the origin country as soon as their carnet permit comes to an end.